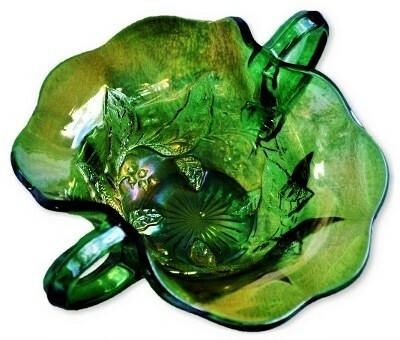 The Millersburg Glass Company, in early 1908 John W. Fenton left the Fenton Art Glass Company after a falling out with his brother Frank Fenton. Though he remained on the Fenton board of directors. 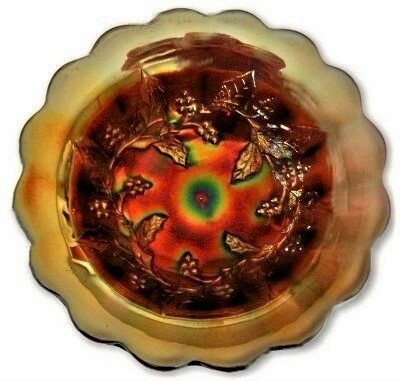 He had helped found Fenton Art Glass with his brother in 1905. The Millersburg factory was located in Millersburg, OH and was constructed quickly. The factory was state of the art for its day and opened in 1909. John was not the best businessman, he was more of a promoter. 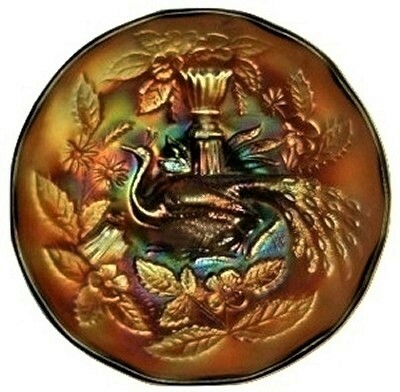 The factory was in an obscure location and the company folded in 1911. 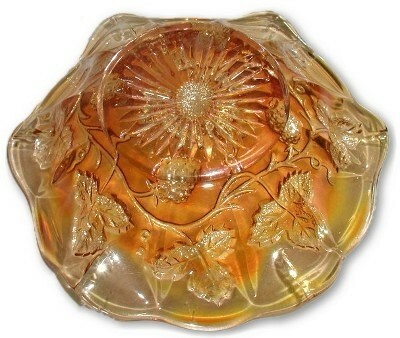 The company was sold to Samuel Fair and was reopened as the Radium Glass Company. This company only lasted one year and closed in 1912. 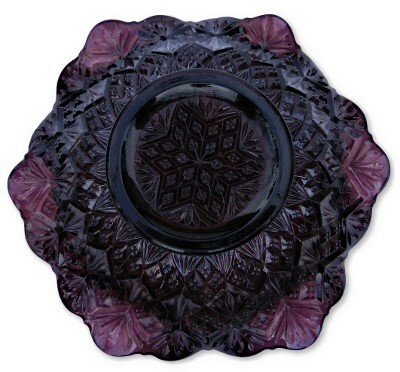 Satin iridescent finish Amethyst Blackberry Wreath ruffled bowl. Measures 6 1/4" X 1 1/4". No chips, cracks or repairs. 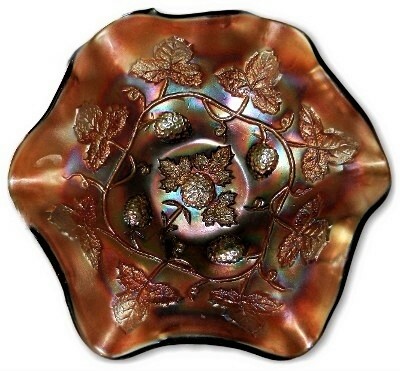 Satin iridescent finish Amethyst Blackberry Wreath ruffled bowl. Measures 6 1/4" X 1 1/4". 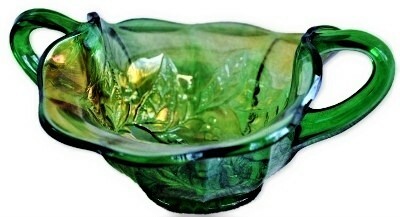 There is a tiny bit of extra glass along the edge from the manufacturing process. No chips, cracks or repairs. 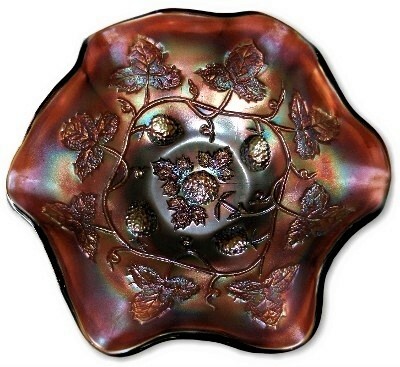 Satin iridescent finish Amethyst Blackberry Wreath 3 in 1 edge bowl. 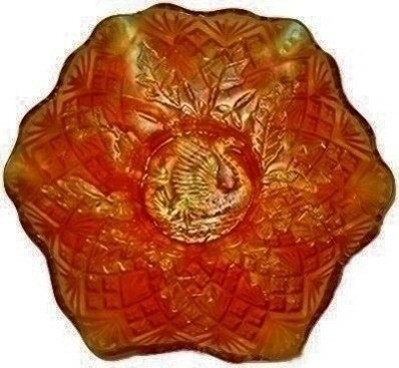 Measures 9" across and sits 2 1/2" high. No chips, cracks or repairs. 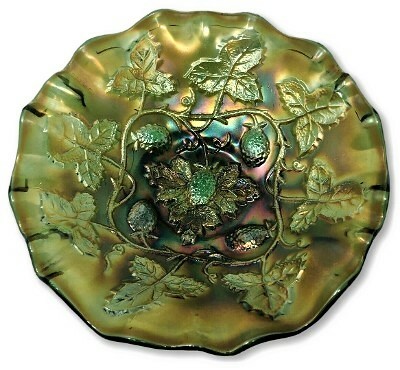 Marigold radium finish Blackberry Wreath 6" bowl. 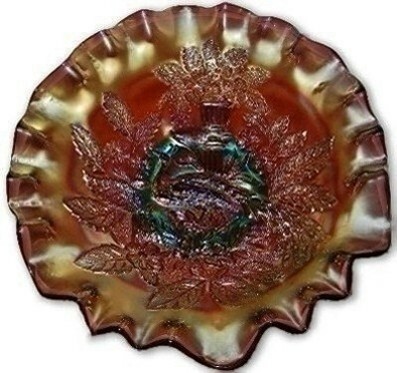 This item is the 3 center leaf version of this pattern. Measuring 6" across and standing 1 3/4" high. No chips, cracks or repairs. 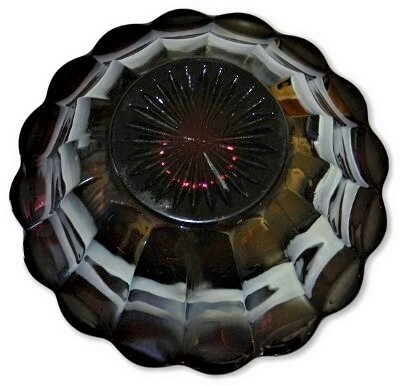 Millersburg dark marigold Blackberry Wreath ice cream shape bowl. Measures @ 7 1/4" X 1 3/4". Light use wear. No chips, cracks or repairs. 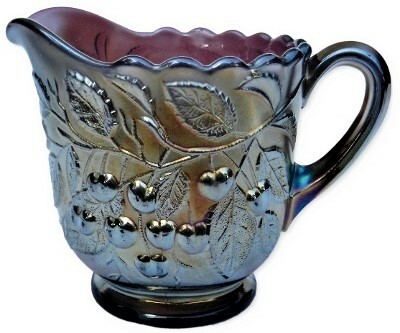 Millersburg "Hanging Cherries" Amethyst/Purple creamer. Measures 5 1/2" X 33/4" X 41/4". Light use wear. No chips, cracks or repairs. 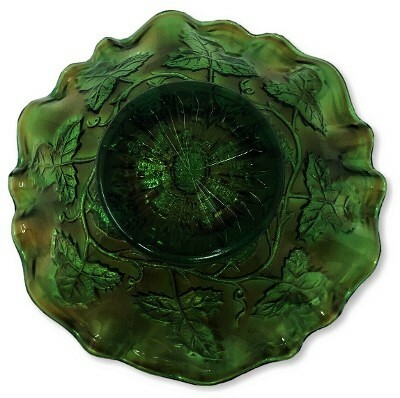 Millersburg green "Holly Sprig" two handled bonbon card tray. Measures. No chips, cracks or repairs. 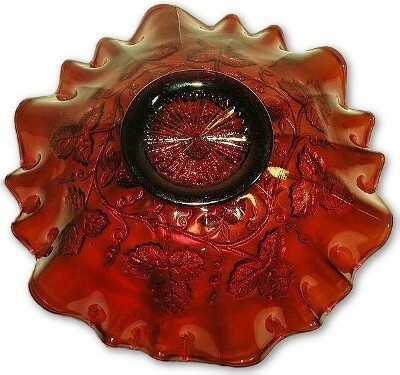 HOLLY WHIRL pattern radium finish fiery amethyst flared edge bowl. Measures 7" X 2 1/2". Very light use wear scratches to the finish of little importance. No chips, cracks or repairs. 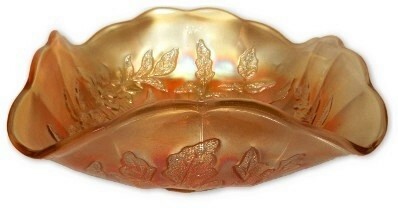 Pastel marigold HOLLY 2 handled bonbon or card tray ISAAC BENESCH 54th ANNIVERSARY advertising lettered item. Measures 7" X 6 3/4" X 2 7/8". 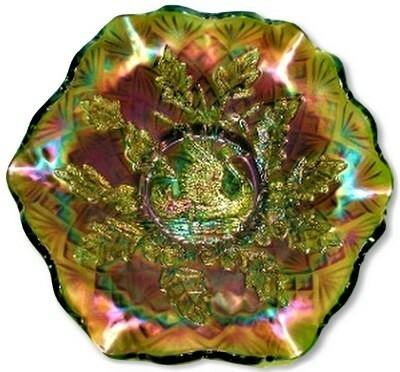 A very nice "LETTERED" carnival glass item with excellent iridescent finish. No chips, cracks or repairs. 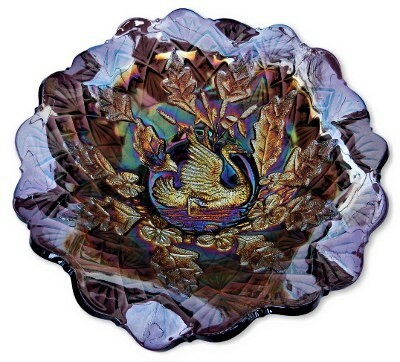 Amethyst satin iridescent finish NESTING SWAN with Diamond & Fan back pattern ruffled bowl. Measures 9 3/4" across and sits 3" high. No chips, cracks or repairs. 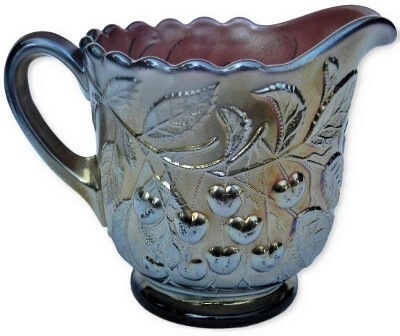 Amethyst radium finish NESTING SWAN with Diamond & Fan back pattern ruffled bowl. Measures 10" across and sits 2 3/4" high. No chips, cracks or repairs. 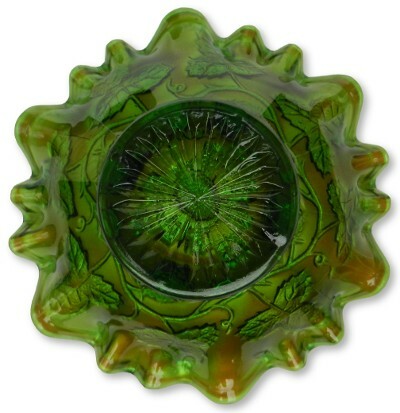 Outstanding green NESTING SWAN with Diamond & Fan back pattern ruffled bowl. Measures 10" across and sits 3" high. No chips, cracks or repairs. 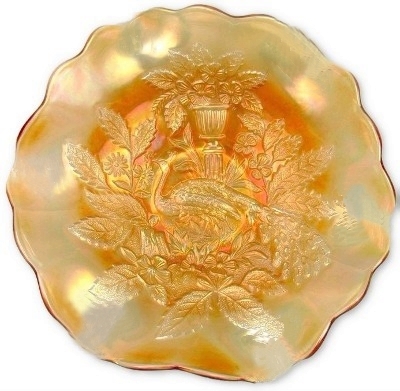 Outstanding dark marigold NESTING SWAN with Diamond & Fan back pattern ruffled bowl. Measures 10 1/2" across and sits 2 3/4" high. No chips, cracks or repairs. 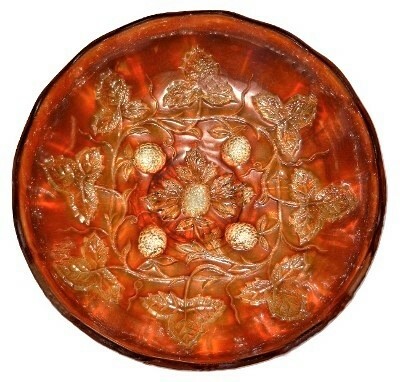 RADIUM AMETHYST BERRY BOWL "NO BEE"
MILLERSBURG PEACOCK small size berry bowl with a stunning amethyst radium finish. Measures 5 1/2" X 1 7/8". 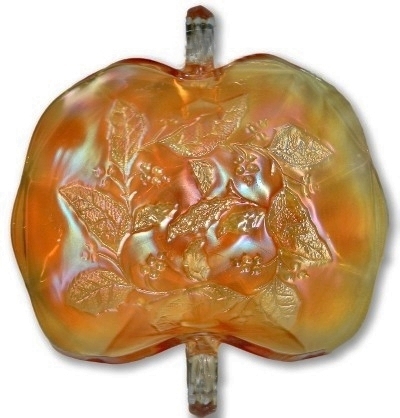 Excellent mold impression and colorful iridescence. No chips, cracks or repairs. 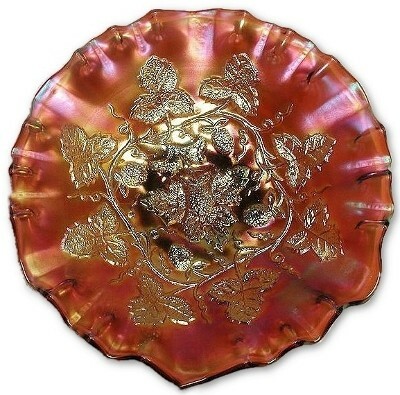 SATIN AMETHYST SMALL ICE CREAM BOWL "NO BEE"
Amethyst MILLERSBURG PEACOCK (no bee, no beads) small ice cream shape bowl. 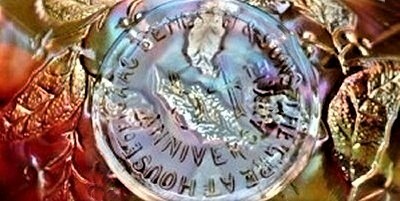 This example has well above average colorful iridescent finish, while the reverse side has a number of in the making straw marks. Measures 5 5/8" X 1 1/2". No chips, cracks or repairs. 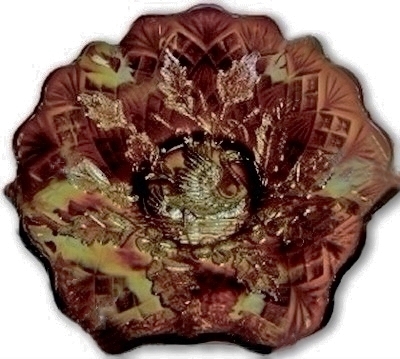 Satin iridescent finish Amethyst MILLERSBURG PEACOCK STIPPLED VARIANT version bowl with the desirable 3 in 1 edge. 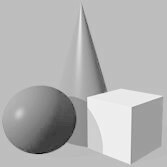 Measures 10 1/2" X 3". No chips, cracks or repairs. 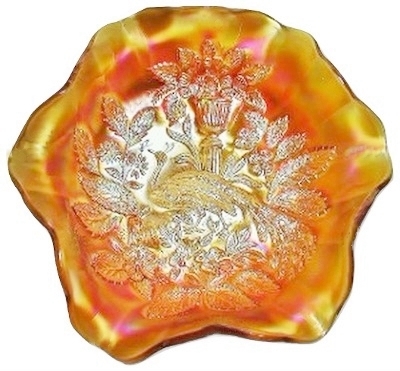 Satin iridescent finish Marigold Peacock and Urn with ribbed back and ray bottom large ruffled bowl. There are only a few light scratches. 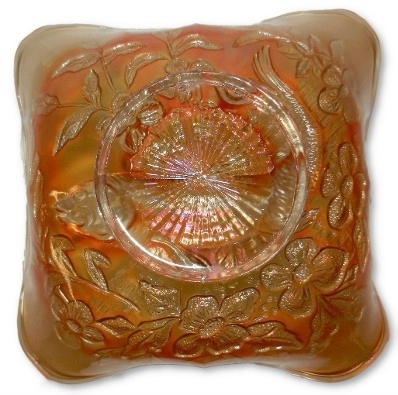 Measures 10" across and sits 3 1/4" high. No chips, cracks or repairs. Radium pastel marigold Peacock and Urn with ribbed back and ray bottom large ruffled bowl. There is a couple of extremely tiny flea bites on the bottom edge and a little dip where one of the seams meets the Marie we are not sure if this was a buffed small flake or from the manufacturing process. Measures 10 3/4" across and sits 3 1/2" high. No other chips, cracks or repairs. 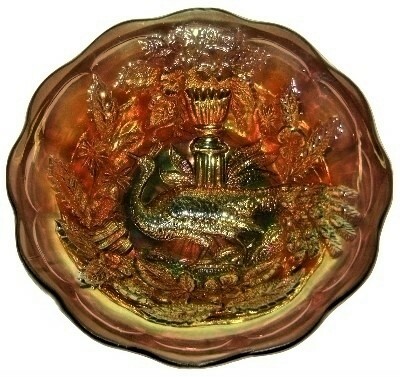 Amethyst TROUT and FLY 3-IN-1 bowl. 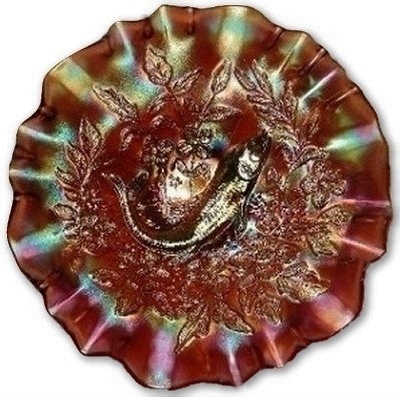 This example has a beautiful satin highly iridescent finish with minor use wear on some of the high points of the fish as is common for this iconic Millersburg pattern. Measures 8 3/4" across and sits 2 1/4" high. No chips, cracks or repairs. 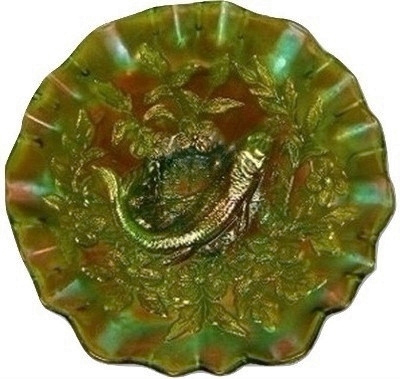 Scarce green TROUT and FLY 3-IN-1 bowl. 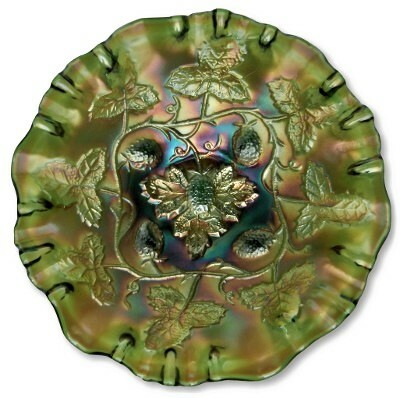 This example has above average multi colored and highly iridescent finish. 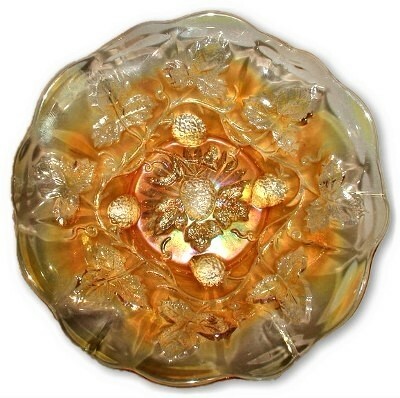 A myriad of tiny bubbles inside the glass add to the individuality of this iconic Millersburg pattern bowl. 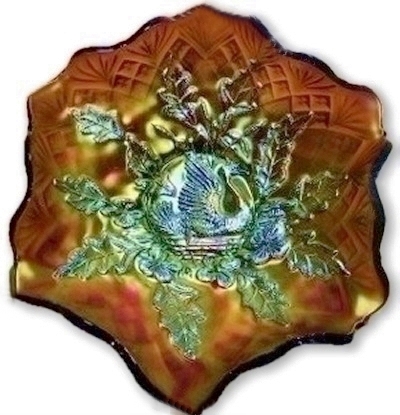 Measures 9" across and sits 2 1/2" high. No chips, cracks or repairs. 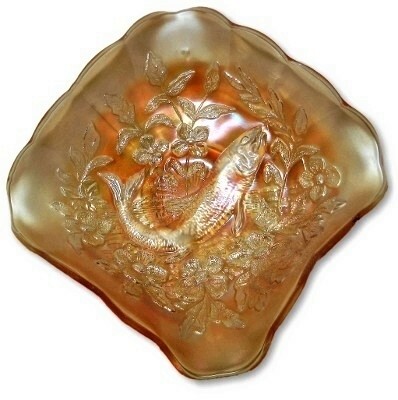 Rare square marigold TROUT and FLY bowl. This is a beautiful example of Trout and Fly and in a very seldom found shape. Measures 8 1/2" X 3". No chips, cracks or repairs.